Which isn’t what Recep Tayyip Erdogan is famous for. But with the lira in free fall, there’s a growing sense that something has to give. 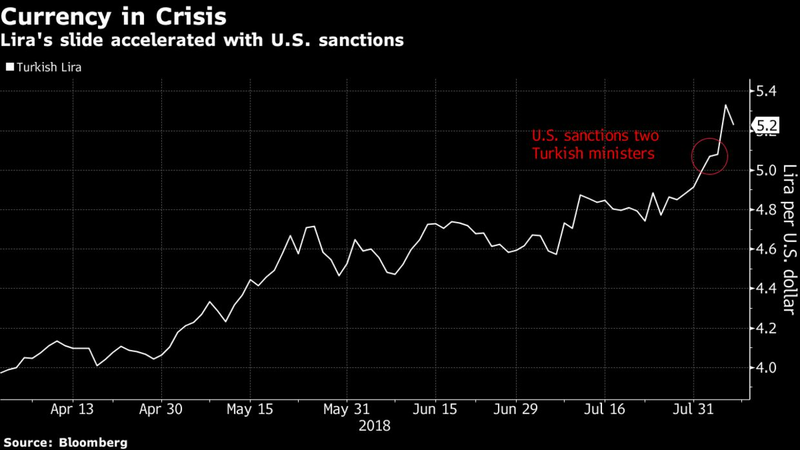 The latest leg of the currency’s downward spiral was triggered by a diplomatic row with the U.S., which imposed sanctions on its NATO ally over the detention of an American pastor. It’s taken the lira’s losses this year to about 30 percent — and they’re cascading through the $880 billion economy, as shoppers confront soaring prices and companies struggle to service dollar and euro debts. Erdogan has insisted that Turkey’s judiciary doesn’t take orders from America. He rejects the notion that his economy has overheated and needs a slower growth path: He’s a fierce opponent of higher interest rates, and backed a wave of fiscal stimulus in the run-up to his re-election in June. And he prides himself on having freed Turkey from the tutelage of the International Monetary Fund. Analysts say all those policies are now in question. Just this month, the lira has tumbled 7 percent, including a 1.4 percent drop on Wednesday to 5.30 per dollar by 12:39 p.m. in London. “Turkey’s on the rack,’’ said Tim Ash, a senior emerging-market strategist at BlueBay Asset Management LLC in London. And the wait-it-out option is fraught with danger. There are signs that Erdogan may be moving to defuse the diplomatic crisis at least, with a Turkish delegation meeting with deputy Secretary of State John Sullivan in Washington today. Absent a compromise that sends the pastor home, further American penalties are expected. On economic policy, a U-turn may be tougher. Erdogan promised in the run-up to elections to take more direct control -– including over the central bank, which has raised lending costs by 5 percentage points this year to 17.75 percent. On July 24, at its first rate meeting after the vote, the bank unexpectedly refrained from further increases. It’s become routine for Turkey’s central bank to take center-stage during a lira crisis. What’s different this time is that many analysts say rate increases alone won’t do the trick. Turkey should also “discontinue immediately’’ fiscal stimulus that tends to offset monetary tightening; repair relations with its traditional western allies at the expense of newer ties with Russia and Iran; and “reintroduce in the cabinet credible names that the market can trust,’’ Maggio said. After Erdogan’s re-election, the president put his son-in-law Berat Albayrak in charge of the economy, removing the last minister with close links to investors. Some observers say Turkey’s president is ultimately a pragmatic leader whose domestic position is secure enough to allow him to retreat, even from deeply held beliefs about the economy. Those include a current-account deficit that economists expect to reach 6.4 percent of GDP this year — one of the biggest among emerging markets. Turkish companies also have foreign-exchange liabilities equal to about a third of GDP, posing a serious threat to banks. The country’s financial system got through the global crisis fairly unscathed, after earlier Erdogan governments enforced stringent capital requirements. Now the banks face risks on all fronts -– from higher rates, as well as a weaker lira. Erdogan knows what extreme market conditions can do to political fortunes. He came to power after a financial meltdown wiped out Turkey’s established parties. For years afterward, he stuck with an IMF program hammered out by his predecessors. Since Turkey finished repaying the Fund in 2013, he’s boasted about ending an era of dependence. That’s one reason it would be hard for Erdogan to seek an IMF bailout (the Fund said Tuesday that no approach for a loan has been made). Another is that doing so would involve drastic changes to his economic blueprint.